Electric dispenser with rotary plug,On/Off Botton, provided with a 30 ml liquid refill. Insecticide effectiveness against mosquitoes, tiger mosquitoes, tropical mosquitoes and harmful and annoying flying insects in businesses and homes. Does not emit fumes or leave ash and emanates an attractive perfume. Notes: Tested positively against Tiger Mosquitoes. It stays in a vertical position all the time thanks to the rotary plug. It emanates an attractive perfume in the room. 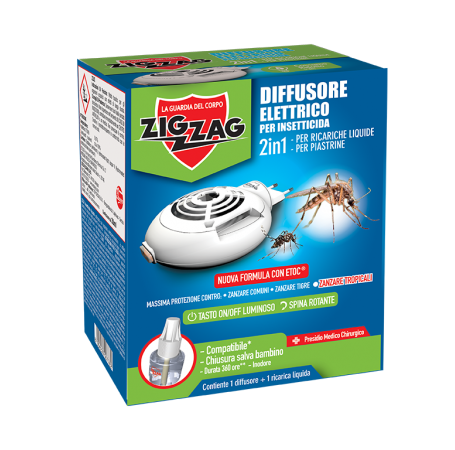 Screw the Zig Zag Mosquito container into the special electric dispenser and connect it to the 220V then switch on with the button on to the device, press it again once you have decided to turn off the device. The device will be ready for future use. Used for 8 hours per day, a bottle will be usable for at least 45 days before running out. If you use the traditional tablets rather than the liquid, place them in the provided slot. Ventilate the room during use. In premises and homes to keep away mosquitoes, tiger mosquitoes and other harmful and irritating insects. In rooms used by sensitive people (small children, asthmatics, ...). In contact with fabrics, paper and combustible materials in general. The product acts by ingestion.